The author explains the classification of remedial measures on the basis of Guna (Nature) and cautions the astrologer against indulging in black magic and other forms of black tantricism that will only destroy his good karma. The Scientific study of phonemes called Mantra Shastra has been explained in considerable detail, showing the importance of choosing the correct mantra with illustrative calculations. A compendium of Mantra provides a ready reference for the professional Vedic astrologer and a comprehensive chapter on Gemology with ready reference tables guides the reader in the choice of the right gemstone. The FAQ answers many doubts that a reader is likely to have. The daily procedure of personal spiritual discipline and the esoteric knowledge of the syllables has added to make this the most comprehensive book of its kind in Vedic Astrology. Various case studies including the personal research of the author in determining the number of letters in the mantra etc, will help in developing expertise by teaching how to systematically work on a horoscope. There are some areas like Vaastu Shastra (Vedic Architecture) & Nimitta Shastra (Omens) that have been left out of the purview of this book for the present. Other areas requiring extensive research like the horoscopes of the ten Sikh Guru's has been touched, but further research in this area has been left for future generations. Sanjay Rath is a graduate in mechanical engineering and has been in Government service in India (1990 Batch). He has authored a translation of Maharishi Jaimini's Upadesa Sutra and another book titled "Crux of Vedic Astrology- Timing of Events" which gives the various tools for timing events related to individual houses of the horoscope. Besides this, he has also authored various articles on astrology for many magazines some of which have proved to be very accurate in their predictions. He teaches traditional Vedic Astrology at the Sri Jagannath Vedic Center at Delhi. He belongs to a traditional family of astrologers from Bira Balabhadrapur Sasan Village of Puri, Orissa. His grandfather, the late Pundit Jagannath Rath was the Jyotish Ratna of Orissa and had authored many books on Jyotish. He was known for his precise predictions and scientific approach. He was initiated into the Gayatri as well as Jyotish (Diksha) by his paternal uncle Late Pundit Kasinath Rath. I have read the book . 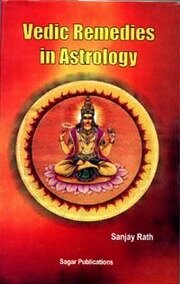 There are many astrological healing solutions given in this beautiful volume . I found so many things in this book which I have't got anywhere else. The writer has done a wonderful work. Hi! I have read the book . There are many astrological heal ..